Here I am starting another year of homeschooling. I guess it’s my 8th official year of homeschooling if you don’t count the preschool years. It already feels a bit like eternity. Did you know homeschooling is exhausting? If you’ve homeschooled for even one day, then I bet you’ve figured that out pretty quickly. Homeschooling is so many things, but I’d like to propose that homeschooling is an investment. You’re investing in your children’s hearts, their character, and their future. An investment means that you have to put up some capital up front. There are a lot of sacrifices involved for long-term gains. These sacrifices that you’re making now should be viewed as investments in your children and in your homeschool. So, what are you investing? Homeschooling takes so much time! No one warned me just how time consuming it would be. I spend time teaching my children. But I also spend time researching curriculum, educating myself about homeschooling, learning alongside my children, planning our homeschool, and reviewing and grading their work. This means that I don’t have much time for many of my own pursuits. I’m investing most of my time in my family and our homeschool. Of course, it’s important to not neglect your own self-care. You need to carve out time for your own pursuits for your spiritual, emotional, and physical health. 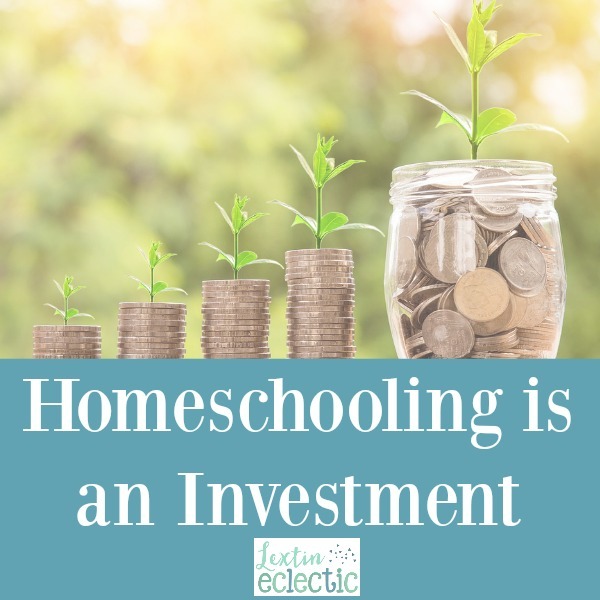 But overall, homeschooling is a huge investment of your time, day in and day out. In my opinion, no, you really can’t. You can use your local library and find lots of wonderful resources online for free. However, you do need to invest some money in your homeschool. You will need supplies. And I think it’s important to purchase some classics that will be read over and over again. What about curriculum? I think in some subjects it’s important to have a framework. In order to get some guidelines to follow, you will need to purchase some resources to help you. No, homeschooling does not have to be outrageously expensive. It can be done frugally. But I’m not sure it can (or even should) be done for free. This is your children’s education. It’s wise to invest in resources – whether that be books, supplies, or curriculum. You’re preparing your children for later education and future careers. And that’s a worthy investment! Homeschooling will absolutely drain your energy. Every day I teach multiple subjects in several different grade levels. I check papers. I plan activities. I choose curriculum and put together our lesson plans. All day long I balance parenting with teaching (and I’m also the janitor and cafeteria lady). I’m not sure there can be any other job that is as physically, emotionally, and spiritually draining. Homeschooling takes everything you have and more. But now that I have years of homeschooling in my rear view mirror with many more on the horizon, I can say with confidence, that homeschooling is worth it all. So, go ahead, take the leap and invest in your family’s future! You’ll love the bonding experience, family time, and shared learning moments.